We are working on growing our first garden at our new house. The conditions are much less favorable than we are used since moving out of the valley, but nonetheless we are looking forward to having some fresh veggies from the garden. 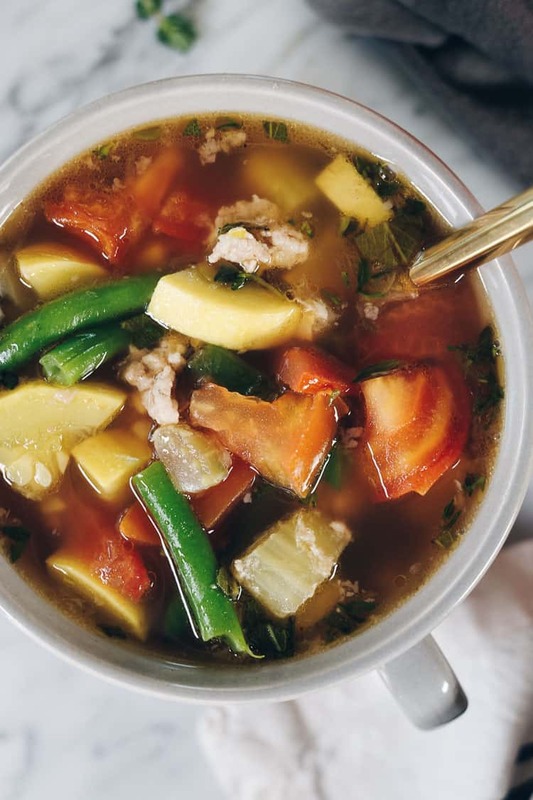 The abundance of summer produce inspired this turkey and summer vegetable soup. It’s light, yet filling and the perfect way to use up your garden fresh veggies! Do you grow a garden? What are some of your favorite veggies to grow? We love tomatoes, onions, squash and all the fresh herbs. Just think of how tasty and juicy the tomatoes are right off the vine. The flavors are so much fresher and inviting when it is straight from the garden, or at least locally grown if you don’t have your own garden. Consider signing up for a local CSA share to get those fresh and local fruits and veggies if you don’t have your own garden. You’ll love how crisp and fresh everything is! We like to make our own bone broth after making a whole chicken. We just hang onto the bones and innards and toss them in the freezer. We also keep a bag in the freezer where we put scraps of veggies as we chop them up for other meals. You know, the ends of carrots, celery and onions. Then, when we are ready to make a big batch of bone broth we just pull out the chicken and veggie scraps and make it on the stove or in the crockpot. You can get our crockpot bone broth recipe here. Once the broth has been made, we freeze it in quart sized mason jars to have it on hand for recipes like this. Then, we don’t have to have the stove going all day to make a batch of soup. You can also use store-bought chicken broth as well. Just look for something that has minimal ingredients and no sugar added. There are more and more great options all the time. 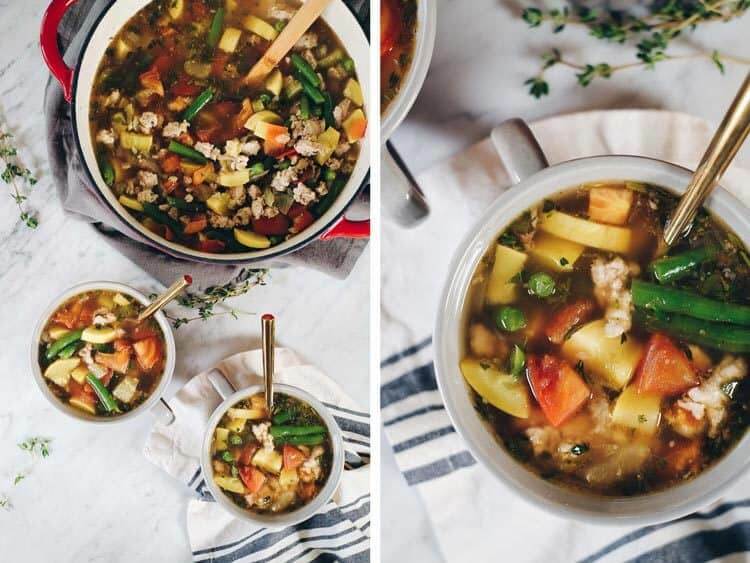 We love having fresh herbs growing outside or in our kitchen because they really do make a huge difference in flavor, especially in a dish like this turkey and summer vegetable soup. 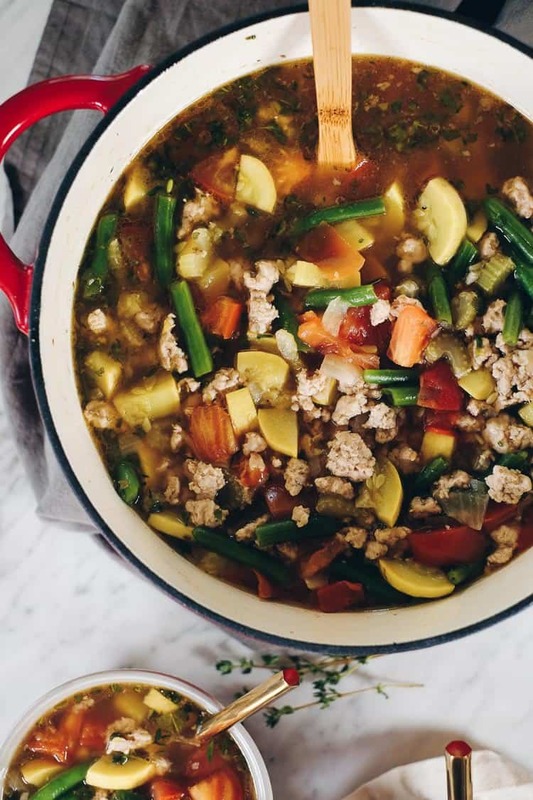 We used fresh thyme and sage for this recipe, and they give this soup savory notes that pair wonderfully with the ground turkey, sweet tomatoes and other veggies. 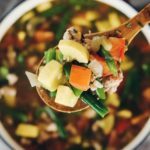 You can add additional salt and pepper to taste at the very end of cooking this soup. Go ahead and take advantage of the fresh summer veggies right now! 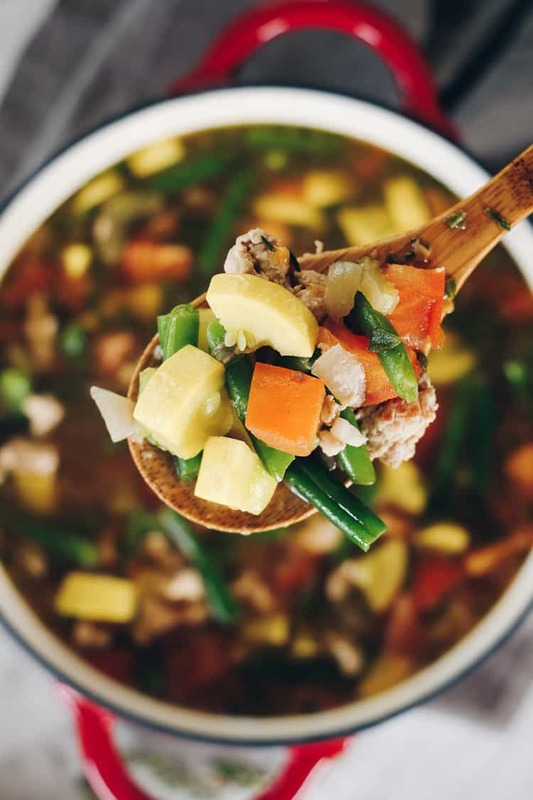 Make this tasty and flavorful turkey and summer vegetable soup. Let us know how it goes by leaving a comment below. Also, take a photo and tag us on Instagram @realsimplegood, so we can check it out! 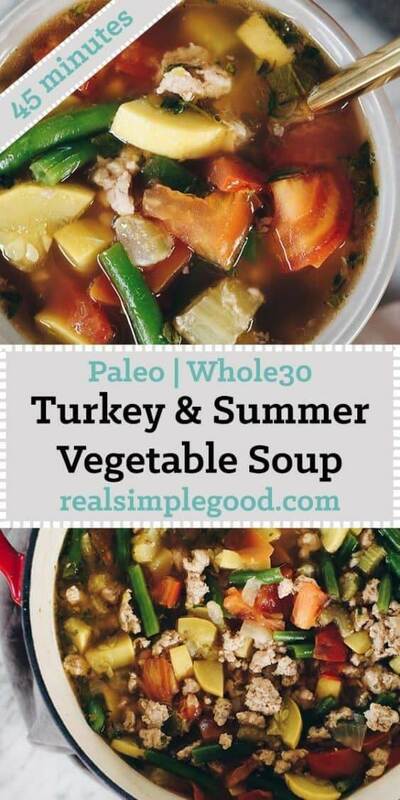 The abundance of summer produce inspired this Paleo and Whole30 turkey and summer vegetable soup. It's the perfect way to use up your garden fresh veggies! Prepare onion, celery and garlic as noted. In a large pot or dutch oven over medium heat, add in avocado oil. Once hot, add in onion and celery to cook, stirring occasionally until the onions start to soften, about 4-5 minutes. Add in garlic and stir to mix. Next, add in ground turkey. Season with salt and pepper and break the turkey into small bits and mix it up with the veggies. Cook, stirring occasionally, until the turkey is browned, about 10-12 minutes. While the turkey is cooking, prepare remaining ingredients as noted. Once the turkey is browned, add in broth and turn heat up to bring to a low boil. Add in the squash and beans. Add more water or broth if needed to reach your desired soup consistency. Return to a boil then reduce heat to simmer. Simmer for 10-12 minutes, stirring occasionally, until the veggies are tender. Stir in tomatoes, thyme and sage. Taste and season with any salt and pepper as desired. Cook for a few additional minutes to heat the tomatoes. You can sub kale or another green vegetable of choice for the green beans for strict Paleo.